Coronation Street star Tina O’Brien was the fourth star to leave Strictly Come Dancing over the weekend, after a shock exit from the dancing talent show. The star has wowed in recent weeks, but on Saturday her catsuit clad performance failed to excite judges, whose sorry scores put her in the bottom two on the show’s leader board. ‘You see this beautiful girl and you think, “Come on, give it to me”, but it never quite gets there,’ Bruno Tonioli said of her stint on stage. And it seems the voters thought the same, calling in in their thousands in support of Good Life star, Felicity Kendall. Clearly upset at her her sharp exit, Tina apologised to dance partner Jared Murillo, but admitted she won’t be hanging up her dancing shoes just yet. ‘I’m going to miss everything,’ Tina told Tess Daly. ‘I’ve had the best time ever and I can’t thank you all enough. And I just want to say sorry to Jared because I just wanted to do more and I’m really sorry. 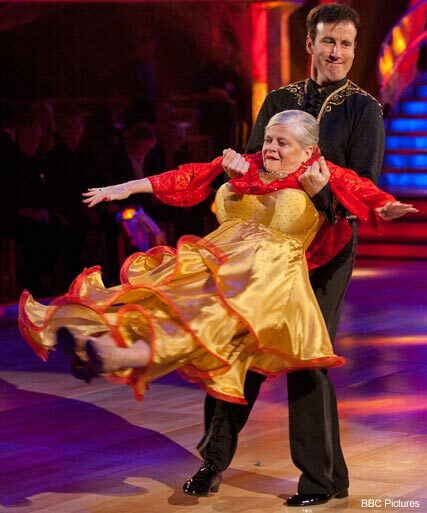 Meanwhile, ex-MP Ann Widdecombe shocked viewers by displaying some interesting dance moves on the show on Saturday. The star was twirled around the floor by smiling dance partner Anton Du Beke, in a move described by judge Alesha Dixon as like a ‘hoover’. Was it time for Tina to go? Or should Anne have got the boot? Let us know YOUR thoughts below.